Although Doctor Who typically presents a secular worldview, Biblical spirituality often surfaces. The episode, “Gridlock”, which happens to by my favorite, contains the clearest presentation of the Gospel message. It challenges the notion that “religion is the opium of the people”, reveals our society’s true addiction, and points to Jesus as savior. In “Gridlock” (contains spoilers), the tenth Doctor, played by David Tennant, brings his companion Martha Jones to New New York in the year 5,000,000,053. They arrive in the lower levels of the city, specifically in the Pharmacy District, where shopkeepers sell “moods” like happiness or anger on plastic-looking stickers, which buyers place on their necks to instantly feel the desired emotions. The Doctor and Martha soon discover the underground motorway has a 24-year-old traffic jam, where many inhabitants have been spending years, even decades of their lives. Somehow, this doesn’t bother them as they deem a 6 years travelling time acceptable. In their cars, they daily sing Christian hymns like “The Old Rugged Cross” in unison, trusting God and their city officials. Travelling with complacent naïveté, the episode implies their religion has become the “opium of the masses” that pacifies them into inaction. 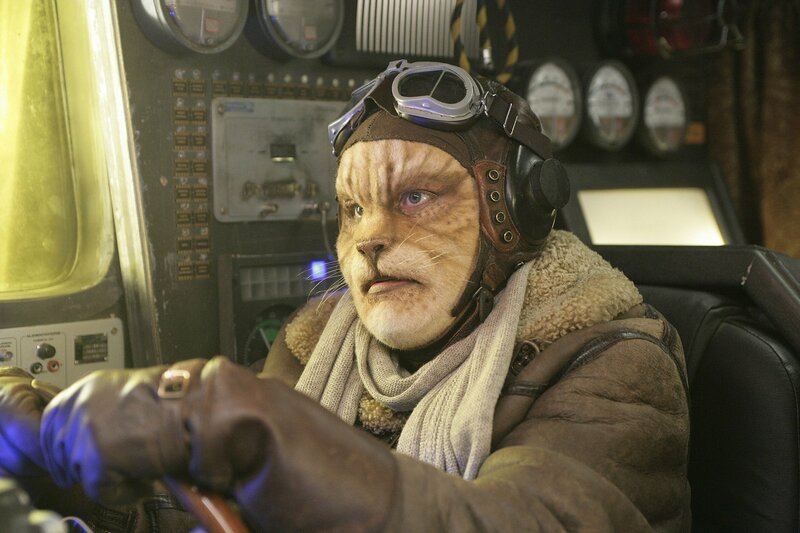 As the Doctor seeks to save his abducted companion, a cat-faced nun finds and transports him to the city surface where he learns the truth. 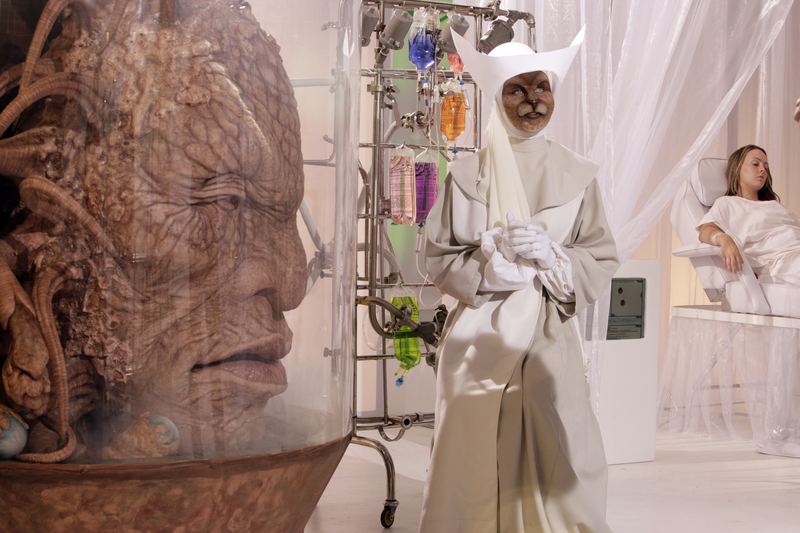 There is no rich, oppressive surface dwellers, but only two people: the nun and the Face of Boe, a recurring character who is a giant face, somehow electrically plugged into the city infrastructure.1 Twenty-four years previously, many surface dwellers had started to use the Bliss drug, leading to complete inactivity. When the drug mutated as an airborne pathogen, the entire population succumbed to apathy and died. In their final act, the senate sealed off the lower levels, saving the lives of those in the lower city. With the pathogen now dead as well, only the Face of Boe and the nun, his disciple, live on. They can maintain the life support on the lower levels, but lack the power to open it up and free the people. We see spirituality is not the opiate of the masses. Rather literally, for those in New New York, it’s actual drugs. But for the audience, these drugs represents feelings, and most center on feeling good: “happiness”, “bliss”, and people even used “forget” to avoid pain. In modern Western culture, I’ve observed that feeling happy seems to be the highest good one can achieve2, so I would say that happiness or pleasure is the actual opium of the people. Instead of apathy, faith can lead to hope. But to make a crucial distinction, faith does not bring salvation. Rather, the object of faith, i.e. the savior, does. Let’s see this play out in “Gridlock”. The symbolism jumps off the screen. The Face of Boe first keeps the whole system running, just as “in [Christ] all things hold together” (Colossians 1:17). Then, he gives his life to set the people free from going around in circles, and they can ascend into a better world.3 In reality, Jesus sets us free from the mundane of this life, from the rat race, from the pointless repetitions that the Doctor described so well. Free from the relentless pursuit of feeling good, Jesus empowers us to live a transformed life, loving God and loving others in this life and forever with Him in eternity. While the Doctor asks, “What if there’s nothing?”, the plot of the episode asks, “What if there’s Someone?” How could this question change your life? Would trusting Jesus (or trusting Him more than you do now) free you from mundane repetitions and the pursuit of happiness? Thanks! It’s always fun to find the Gospel of Jesus in great TV.